After receiving some welcome feedback and really thinking about the flow and usability of my website, I felt it needed a change. Although it served the purpose faily well and I liked the design for the most part, it had a few areas where I felt it lacked and needed more time, effort and/or money than I was willing to put in. The idea behind the fresh new look is to make it easier for you to find the information you want quickly and to improve the flow between different areas, allowing you move through the content with relative ease and without having to think too much about where you want to go next. The website will present you with related content to what you are looking at when browsing the main subjects on the website and aims to make you aware of different areas of the website that are available to view no matter which order you view the content in. 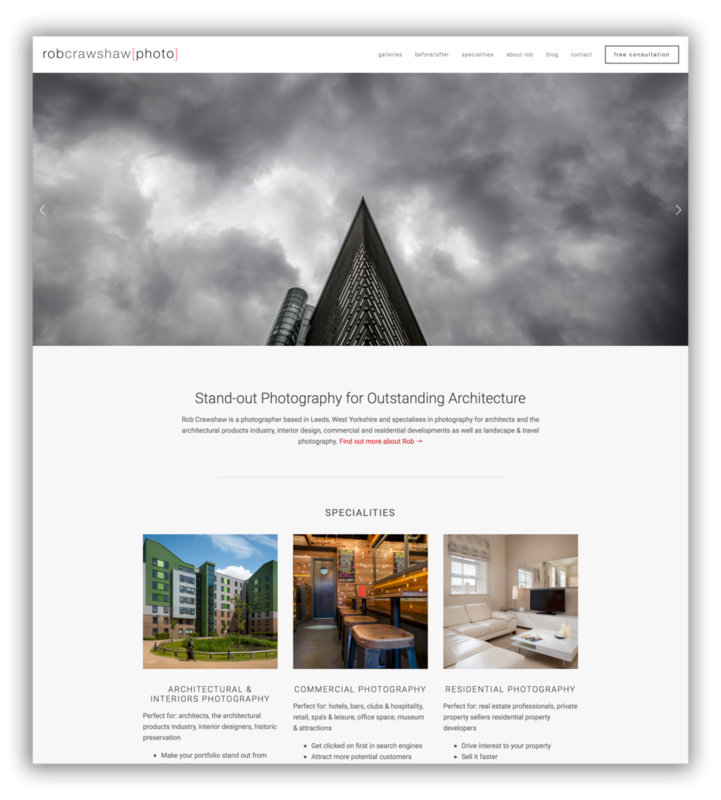 I have enough web development and design experience under my belt to put a website together myself, however, I originally chose a CMS - Wordpress - for my website for the speed, ease and the decent amount of flexibility it offers so that I could make my primary focus my business and my photography. Using Wordpress I could have gone in and most likely found the solutions to some of my problems by using various different plugins, tweaks to the backend and the addition of design elements (on top of the others I'd already implemented), however, finding the plugins that work well, comparing them with others, free vs paid, finding and tweaking code to my needs and testing it always took more time than I wanted it to, it wasn't fun and I just wanted it to work. Along with this I just could not find a template I was 100% satisfied with and that could fully achieve what I wanted. Enter Squarespace. I had been aware of Squarespace for a long while now but had cast it aside due to concerns about the higher price of it vs a self hosted Wordpress website. However, I had reached a point and felt like I had to at least try the 2 week trial. It didn't take long to sell it to me, after a couple of hours using it, I had a beautiful website, with the majority of my content transferred from my Wordpress install, which had the same functionality, up and running with little to no hiccups. From this point all I had to do was perfect the design, layout, implement my SEO and I was good to go. The fact it took me so little time to get to this point, requiring no faffing with different plugins and backend tweaks made it worth the price you paid to me. Squarespace takes care of all the optimisation of images for different screen sizes, reducing loading time, something I really struggled with on Wordpress without destroying my images with compression, all the templates are responsive and work beautifully on mobile and all the other admin like caching, backups and linking up the domain (depending on whether you buy one from them or not). Along with that they have 24/7 support which I haven't had to use but it's nice to know it's there should I need it. The knowledge base and community covers a great number of topics as well which is also very handy. And because there are less variables involved in the Squarespace CMS it's much easier to find the answers you need rather than trauling through different blog/forum posts that all approach a similar thing in a different way. A couple of other nice little features are focus points for images so that you can have some control over what part of an image is shown, should that image have to be cropped or resized for say, a thumbnail for instance. There is also a code block and the ability to inject code into the header/footer of a page, or site wide, if you want to get technical. And did I mention the templates are stunning? I could go on and on but you can find all the features offered on their website. All in all, I'd recommend Squarespace to anybody, experienced or beginner website creators alike, it offers a platform which is easy to build on, is more flexible than you may think and that could save you a whole lot of time now and in the future and I think this alone justifies the cost. After all, time is money, right? Have you used Squarespace or been holding back from? Any questions about it? Do prefer Wordpress or any other CMS for your website? Let me know in the comments!